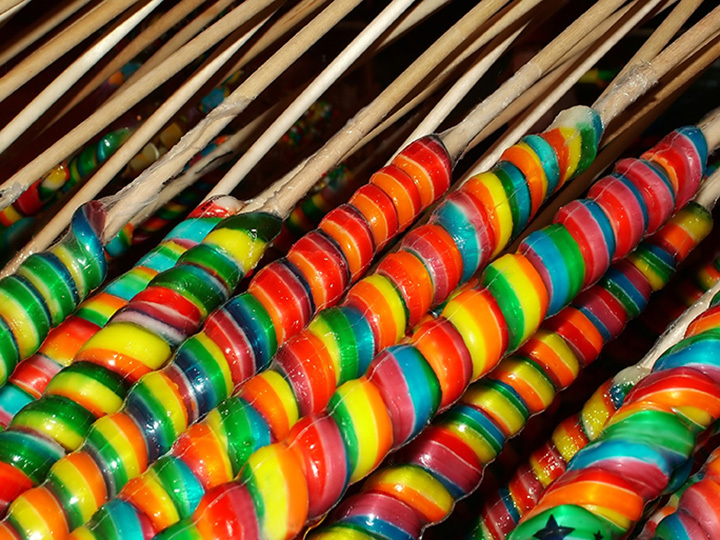 There are sweet spots located across New Mexico that are just waiting to satisfy your candy craving. When you just have to have a piece of chocolate, or a caramel apple, or a melt-in-your-mouth truffle, these 10 candy stores in the Land of Enchantment are the ideal places to indulge. You’ll find more than 40 varieties of fudge at this sweet spot high in the Carson National Forest in the Sangre de Cristo Mountains. Favorites include red chile chocolate pecan, pumpkin chocolate chip and green chile pistachio. A family-owned and operated business that claims, “We don’t just sell fudge, we sell happiness!” And they’ve been making customers happy for three generations. There’s a great selection of retro candy like Abba Zabas and Mallo Cups, plus a selection of old-fashioned hard candies. Don’t miss the Sassafras Drops. This candy is made to eat—not to keep! They’re renowned for their pinon candy, from New Mexico’s state tree the Pinon Pine, which they put in everything from toffee to pra-lines and brittle to their fine chocolates. They use only the finest ingredients and never any preservatives. It’s been family-owned since the 1950s and now has two locations, here and in Albuquerque. Hand-dipped chocolates come in one-half to two pound boxes or buy by the piece. One-of-a-kind creations crowd the display cases in this artisanal candy shop in the heart of downtown, like a whole-roasted New Mexico Arbol chili dipped in agave caramel and dark chocolate. You’ll find hand-dipped truffles that showcase local organic ingredients, featuring medicinal herbs, agave nectar, honey, oat and nut milks and organic fruit nectars and purées. Caramels are made in small batches and agave nectar is used instead of cane sugar and flavors include pinon, chili and smoked salt. Owners support local organic farming. There are dairy free and vegan confections, too. If a wall of licorice in a variety of flavors from across the globe doesn’t sound heavenly to you, we don’t know what does! This spot has been a downtown tradition for more than 30 years. The store is a sugar rush of 20 flavors of fudge, fresh-dipped and glazed fruits, handmade chocolates, hard rock candy and truffles, caramels and brittles. Specialties of the house include chocolates made with local southwest flavors, including green and red chili brittles and pinon caramels. A good selection of sugar free options, as well. Step into this store and instantly you are hit with the sweet smell of homemade candy. Most of what you’ll see in the store is made on-site. The recipes are tried and true in this family-owned and operated place of sweet dreams. The homemade caramel is used in their filled candies as well as on their hand-dipped caramel apples. You’ll also find lollipops, candy cups, dipped fruit treats, brittles, bark, toffee, nuts and chews and assorted fudge. If you want a savory treat, try some of their signature pickles. Don’t let the frozen custard name fool you, this store has a great selection of delicious candy too. Homemade fudge comes in a variety of flavors including divinity, a sweet treat made with marshmallow cream. They make their own twist lollipops, marshmallow pops and gourmet candy including caramels, truffles and brags (something similar to a turtle). Also on hand are the store’s signature themed candy bars which incorporate locally sourced ingredients like green chile, lavender and smoked serrano chile. Try the chile peanut brittle. It is out-of-this-world delicious. As are so many other sweet things here. Run by a boutique chocolatier and candy maker, these are truly artisan chocolates. Ingredients are all natural and no artificial preservatives or dyes are used—chocolate and sugar kick the candy making process off. You’ll find truffles, toffee, fudge, turtles, caramels and, of course, the brittles. Pinon nuts and red and green chiles are not used sparingly! This is the proverbial kid in a candy store experience. So many tempting things all around, you just won’t know where to begin. A few hints: Try the dark chocolate butter-scotch truffle, salted caramel slices, chocolate covered gummy bears or chocolate cov-ered cherries and you can’t go wrong. The owner, for whom the store is named, uses only pure, fresh and natural ingredients and never any preservatives, additives or anything artificial. For close to four decades, this candy maker has been a favorite for residents and visitors looking to soothe their sweet tooth. They make small batches of toffees, brittles, caramels and fudge, hand-stirred in copper pots, a technique that ensures the chocolate is rich, smooth and consistent in taste and texture. Of course, much of the candy features the favored New Mexican ingredients of pinon nuts and chile. Pick up a box of Santafevorites, a collection of pinon-laced favorites or the Ristra Mix, a flavor-punch of red or green chili creams, caramels and clusters. Caramel apples are extraordinary. Ask for the chocolate bourbon or chocolate covered frozen bananas, a locally-known favorite. This is a store that is in the business of fun as much as it is in the business of selling candy. There are more than 1,000 varieties of conventional, unusual and nostalgic candies in this self-serve shop that looks like a whimsical candy factory. The experience will hearken to the kid in everyone. There are bulk containers and shelves of candy in every corner—from jelly beans to gum drops to hand-dipped chocolates. If you’re hankering for that candy memory from your childhood, this is the place to go.